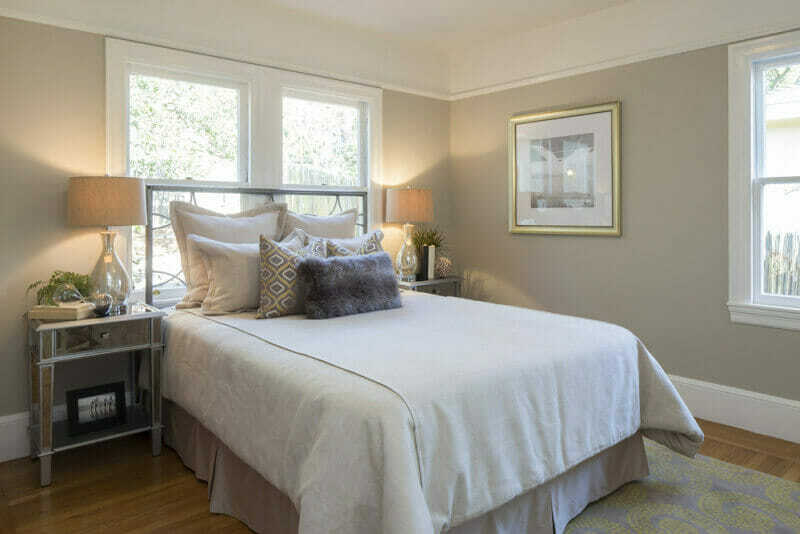 For many people, master bedrooms are a deeply personal space. It is often the only room in the house set aside for rest and relaxation. Regardless, it can be difficult to keep it this way. 1. Thread count is important. When choosing sheets, take note of their texture and thread count. Typically, a sheet set with a thread count of 400 is ideal. Even better if they are Egyptian cotton. Also consider how you sleep and if you tend to get warm at night or are instead cold. These factors will affect how well you sleep and the type of sheets you should purchase. If you are often cold consider a thicker cotton or even flannel sheets. These will provide extra insulation. If you are often hot, do not stray from cotton sheets. Cotton is far more breathable than silk or sateen which trap body heat leaving you feeling even warmer. 2. Curtains and blinds serve more than one purpose. 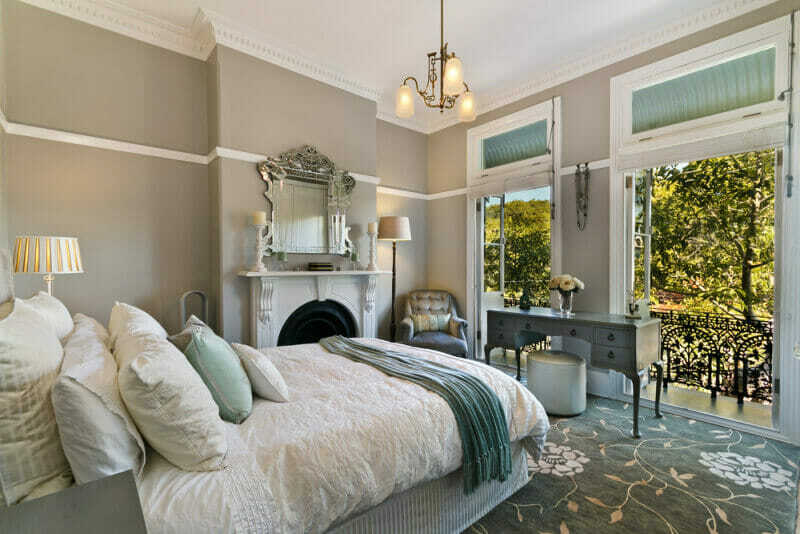 Window coverings are often considered solely on how they look. 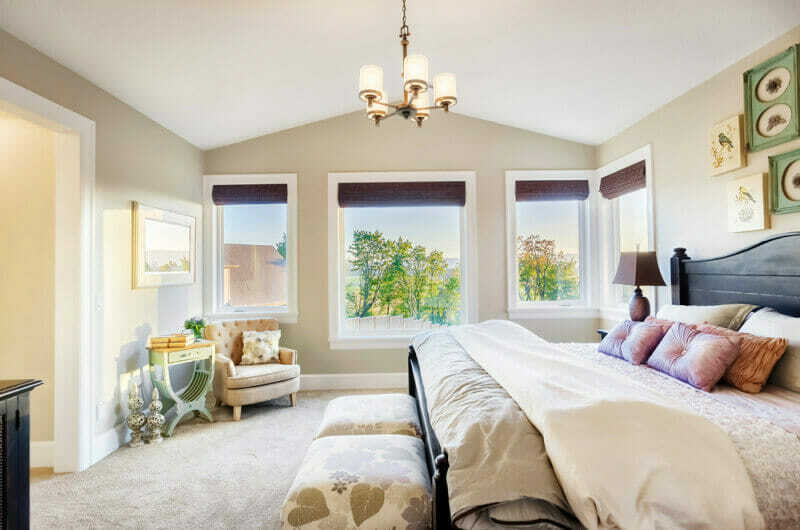 However, it is important to note that curtains and blinds have many beneficial features. Room-darkening shades or curtains are ideal for those involved in shift work or who just like to sleep in every now and then. They keep a warm dark regardless of the time of day. In addition, a pair of drapes with an insulated backing can make your windows more energy efficient by deflecting heat or cold from the outside. 3. Paint colors directly affect the mood of a room. 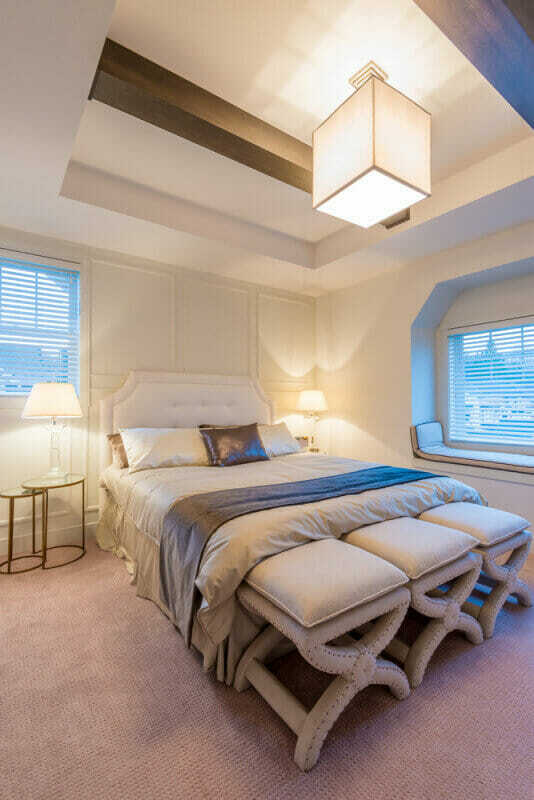 When choosing your room’s color palette, it is best to avoid bright, vibrant colors. These colors are not considered to be relaxing and may keep you from falling asleep. But don’t worry, you can still choose colors that you love, just make sure they are more subdued. 4. It’s important to have a soft place to rest your feet. While hardwood flooring and tile can be beautiful, they tend to be cold first thing in the morning. This is why most bedrooms have area rugs covering the area under and around the bed. They provide a soft, stepping- off point. If your room already has wall-to-wall carpeting then you’re off the hook… unless you hate the carpet. If this is the case, you can purchase an area rug that coordinates with the room and hopefully detracts from the carpet underneath. 5. You can never have too many pillows. 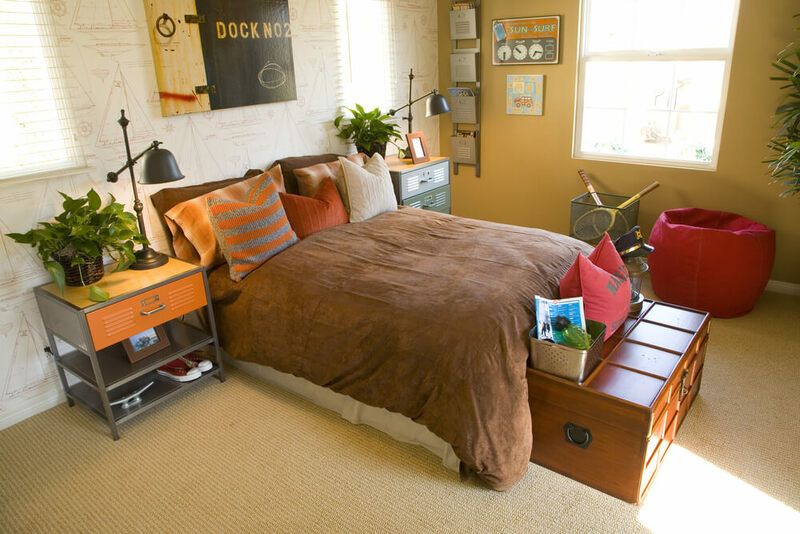 In an otherwise neutral bedroom, accent pillows are a perfect way to add color to the space. You may even consider basing your bedroom’s color scheme off of that found on your accent pillows. This will create a cohesive look throughout the space and make the room’s decorating feel intentional, not haphazard. The large-print wallpaper in this bedroom avoids appearing too overwhelming by maintaining a subdued color scheme. 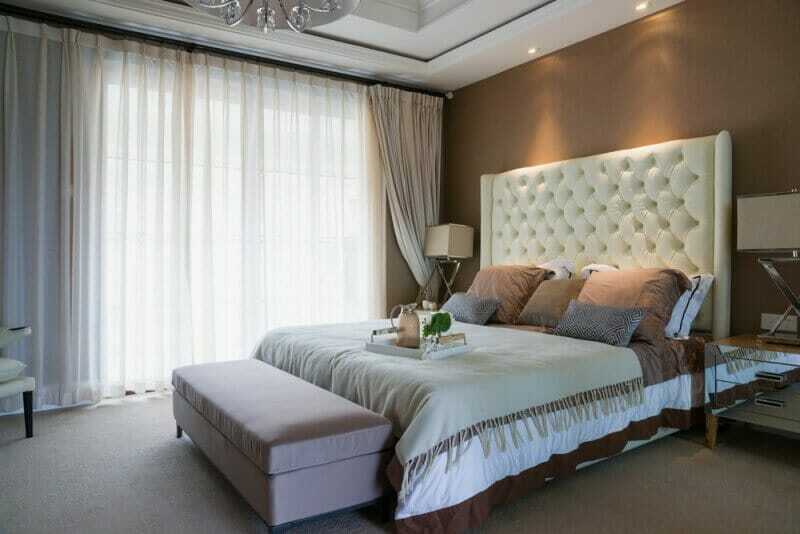 A luxurious, tufted headboard is the perfect focal point for a master bedroom. The large, four-poster bed in this traditional space provides a striking statement piece. 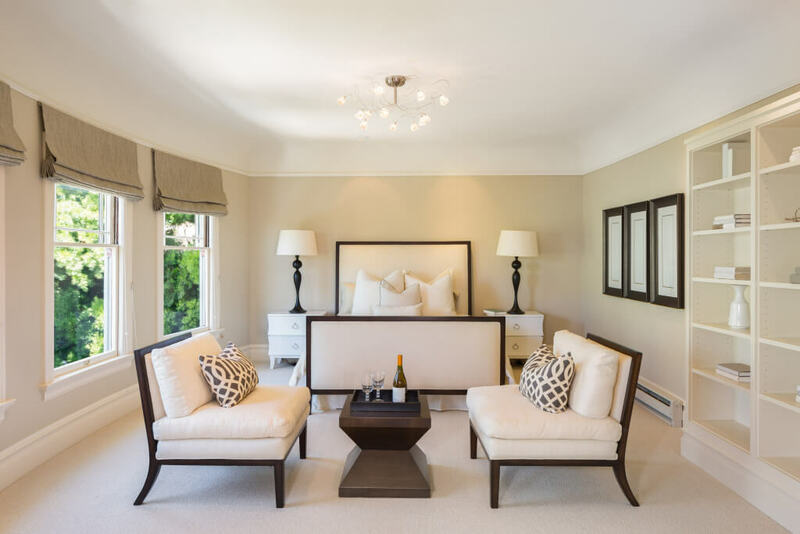 A comfortable space to enjoy a morning coffee and book is a welcome addition to any master bedroom. To add interest to a neutral space, include varying textures in carpeting, bedding and even wall coverings. The unique cowhide bench adds some flair to this otherwise contemporary bedroom. The navy and tan color scheme in this room creates a warm and inviting space. Consider your ceiling as the “fifth wall” and paint it a color other than traditional white. 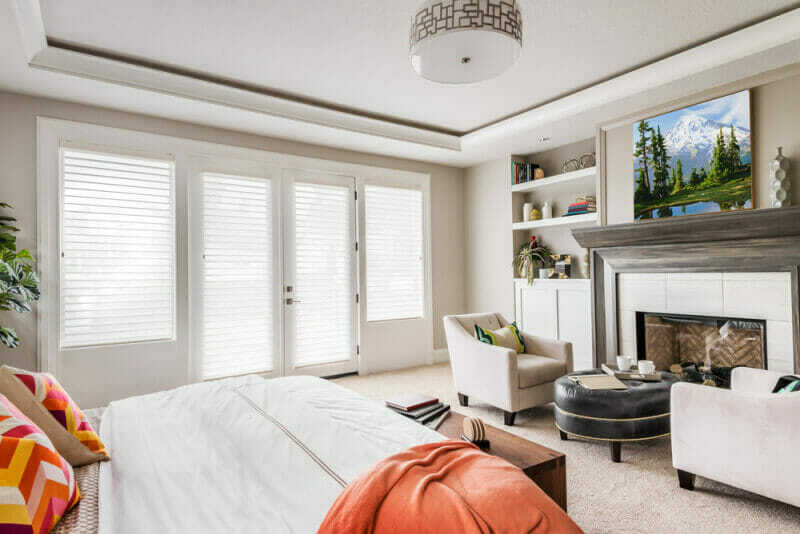 Select large artwork, when a master bedroom is of considerable size, to reflect the scale of the room. The grey accent wall accents this room’s interesting peaked ceiling. 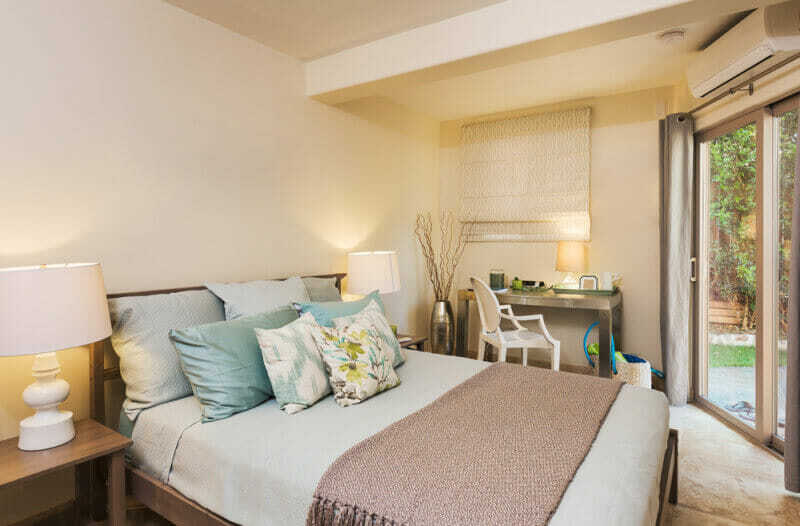 Choosing the perfect furniture layout is essential when dealing with a small bedroom that has an unusual floor plan. 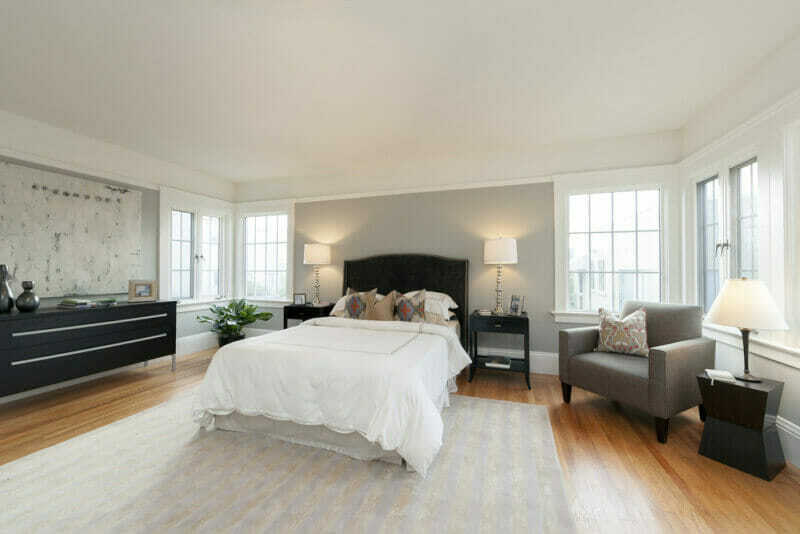 For molding located close to the ceiling, consider painting the area above the molding and the ceiling the same color. This will create the illusion of high ceilings. 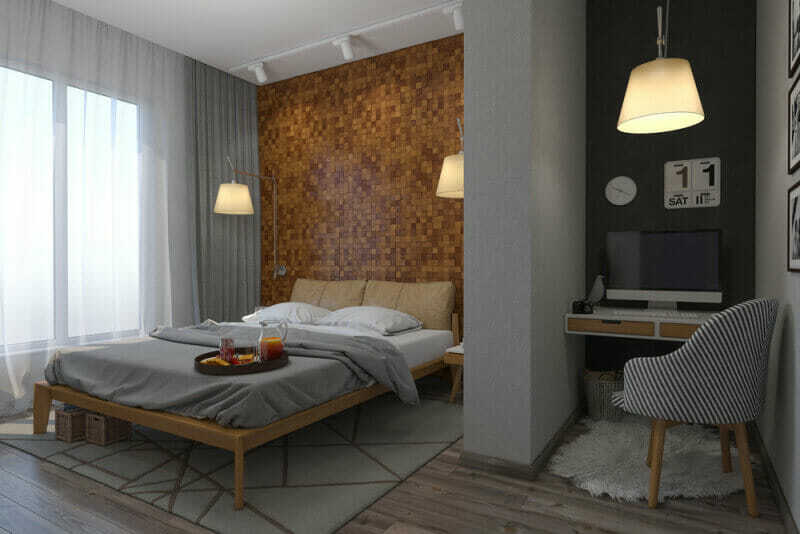 This simple, Scandinavian-style bedroom features a unique, feature wall and recessed office area. 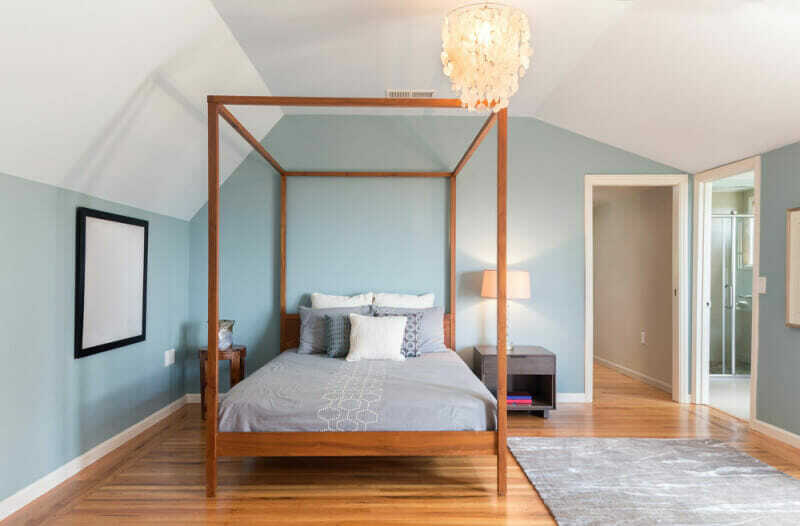 The vaulted ceiling and skylight in this space provides the bedroom with wonderful, natural light. 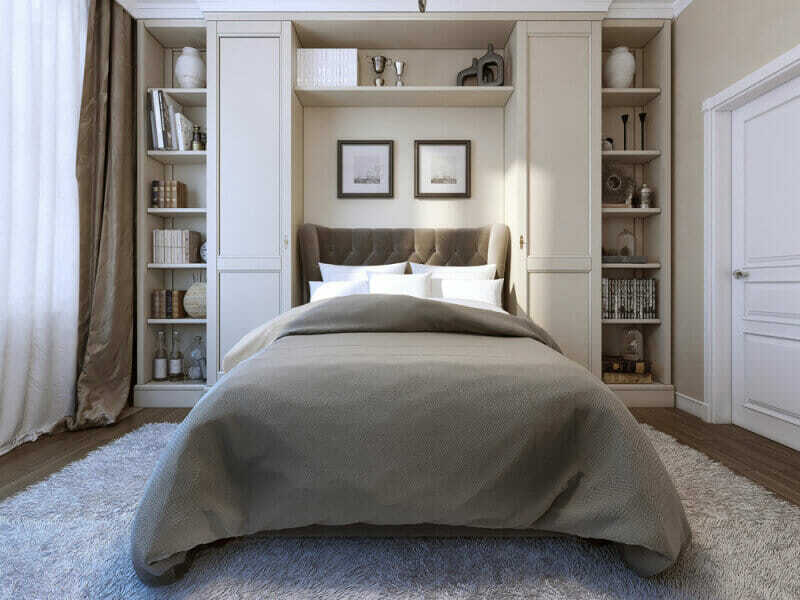 In bedrooms that lack adequate floor space, consider installing additional shelving to double as storage and a unique architectural detail. 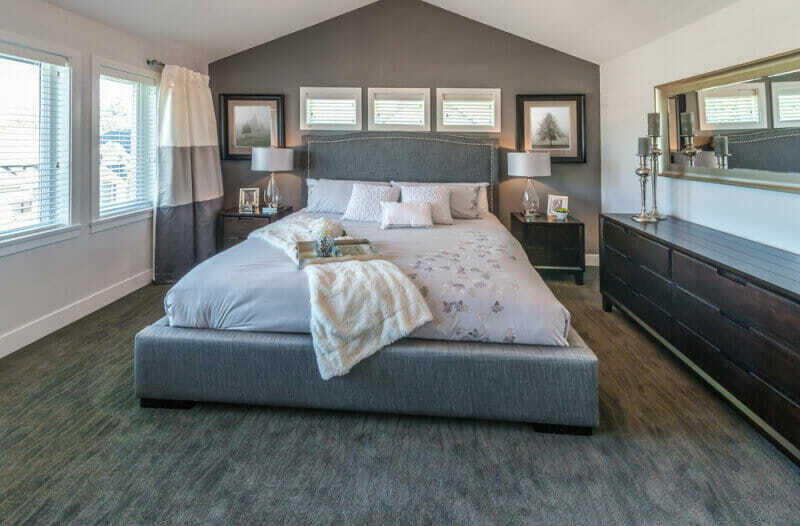 While it may be unusual, layering an area rug on top of carpet is a great way to accent a master bedroom’s sleeping area. The unique chandelier in this space creates an ethereal feel against the strong black lines of the coordinating furniture. 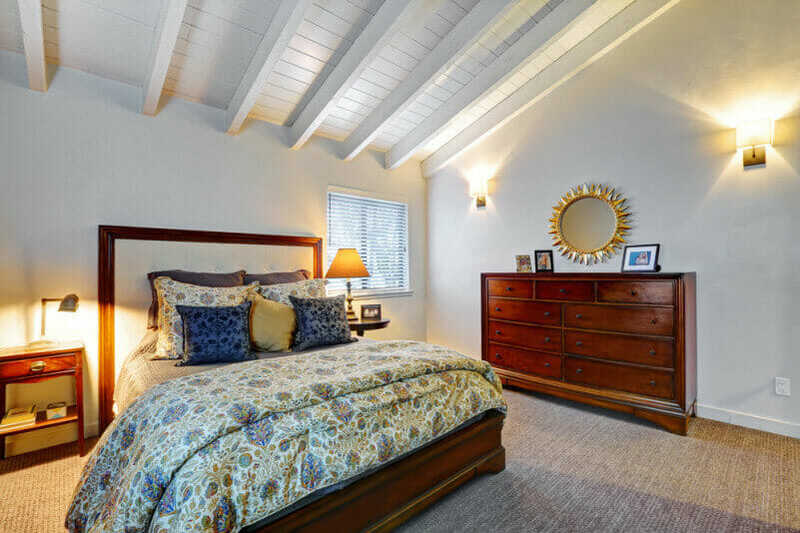 The peaked, painted wood ceiling beams in this bedroom create a beautiful, understated touch. 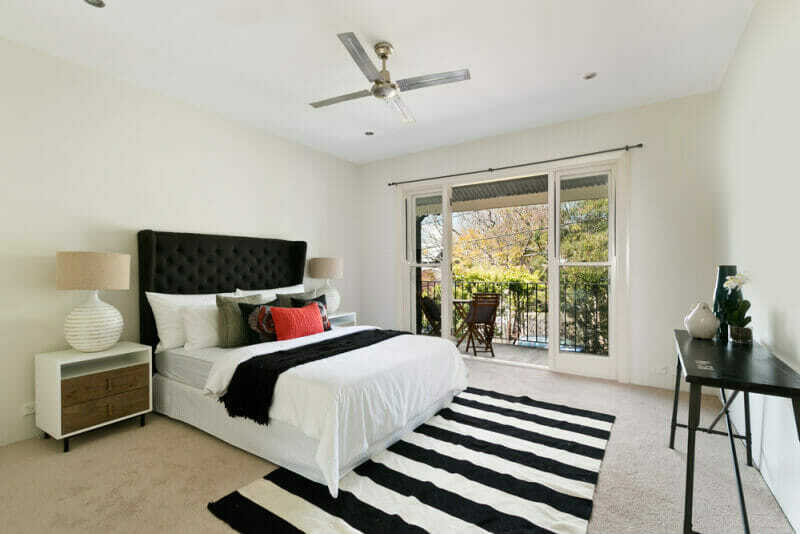 For homes located in hot, humid climates a large ceiling fan is a must. Be selective and choose one that ties into the bedroom’s decor. 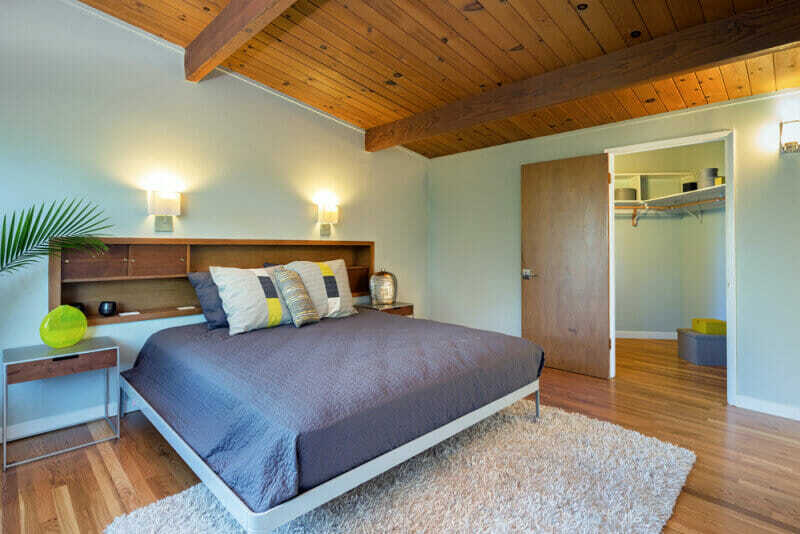 The bed in the master bedroom can be placed on an angle if sufficient floor space is available. This beautiful fireplace with large, rustic mantle creates the ideal master bedroom retreat. A comforter or duvet cover can be a great starting off point to great a cohesive master bedroom color palette. The center wall piece with decorative molding is an interesting backdrop to this tufted, fabric bed frame. When architectural details – wood flooring and crown molding – are present the remainder of the accessories in the room can be understated. The built-in shelving display in the masculine master bedroom is ideal for displaying items important to the homeowner. 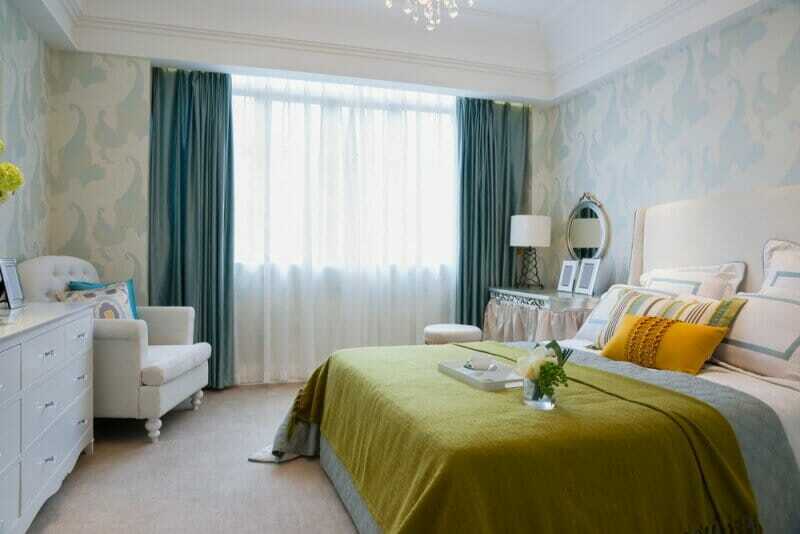 Graphic curtains are a great way to add interest and a bouncing off point for the remainder of the room design. Framed by beautiful, fold-out patio doors a view of the outdoors may be the perfect focal point. 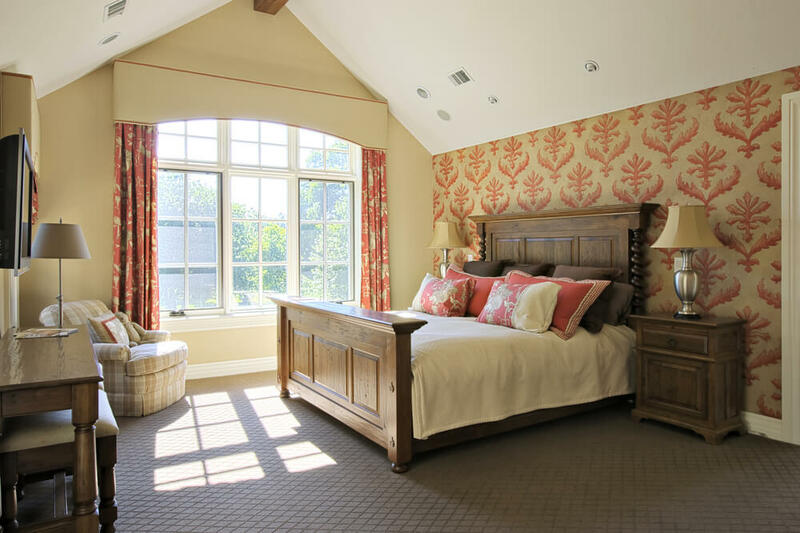 The beautifully framed pattern above the bed acts like a large piece of art in this master bedroom. This feminine space creates subtle elegance with pastel bed linens and a soft gold bed frame. 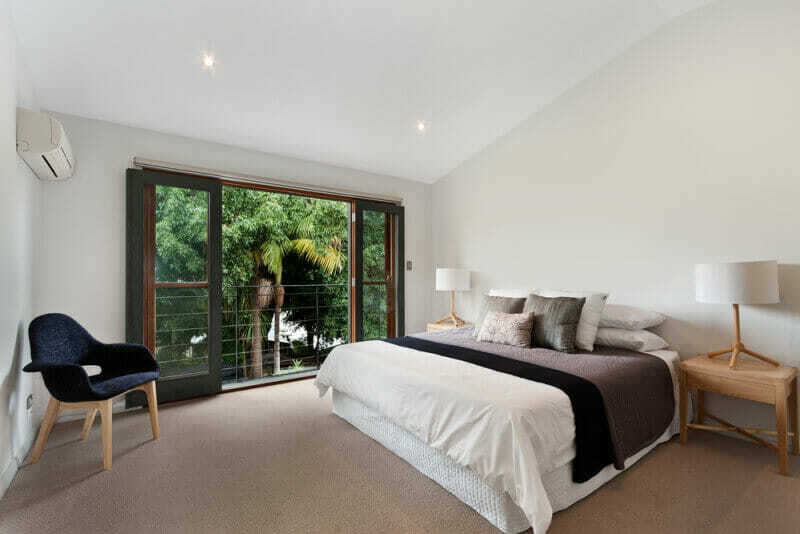 When windows are as large and expansive as these it makes sense to position the bed to allow a direct view of the outdoors. 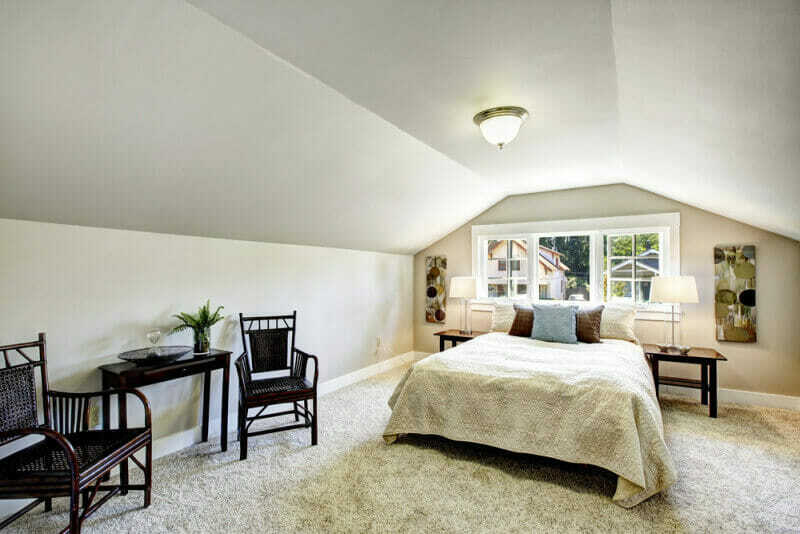 An attic bedroom can be made to feel more expansive by painting the walls and ceiling the same color. Consider incorporating three matching ottomans in place of one, large bench. Hanging pendant lights are a great alternative to traditional lamps. They create the same type of task lighting and allow for more space on the nightstand. A wall mounted headboard provides a unique display case for books and other personal items. If the master bedroom doesn’t contain existing closet space, add a modular organizational unit to the room. 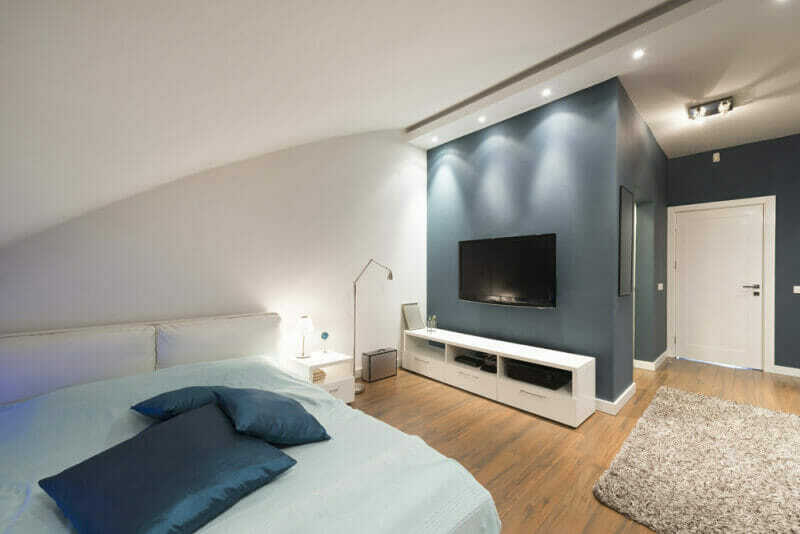 This shade of blue in this space creates a cozy environment perfect for a good night’s rest. 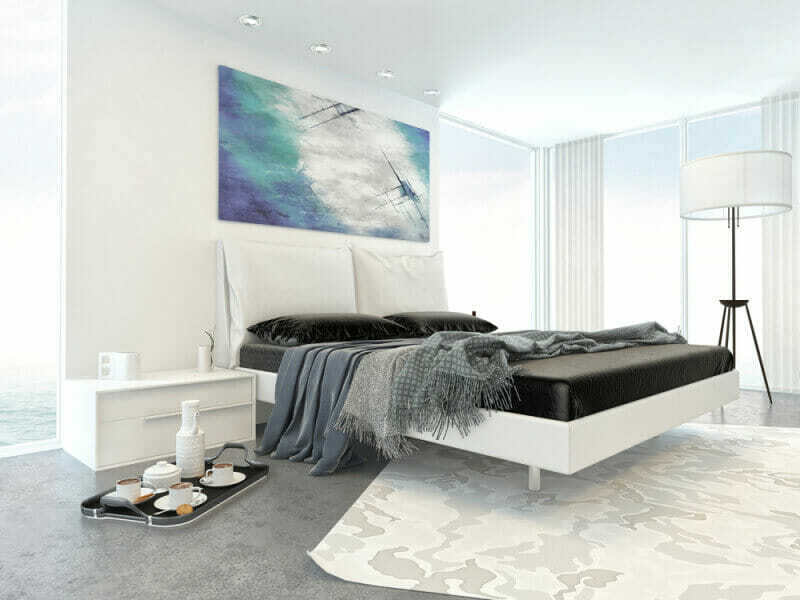 An area rug is not always required to be placed squarely beneath the bed. Consider moving it on an angle, for a change. 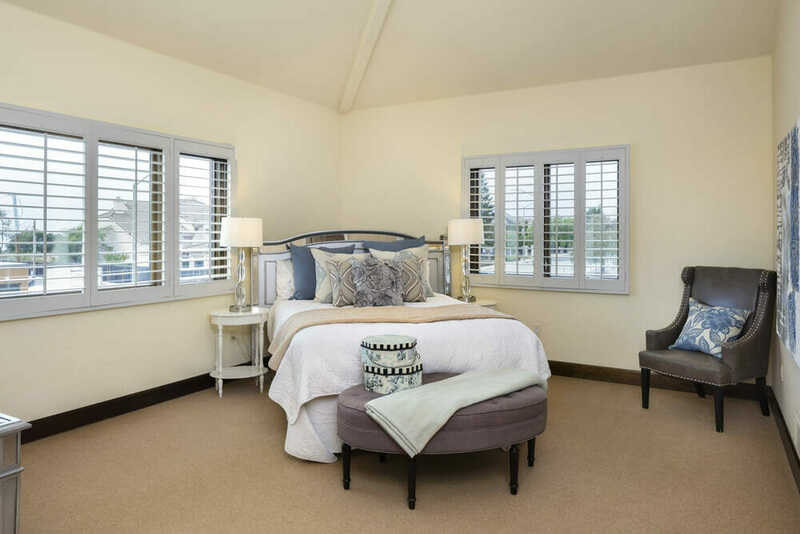 This bright and airy bedroom is kept simple with a neutral color palette and warm wood tones. This Scandinavian-style, four poster bed coordinates beautiful with the bright blue walls of this master bedroom. A neutral palette can be made more interesting by incorporating varying textures throughout the space. 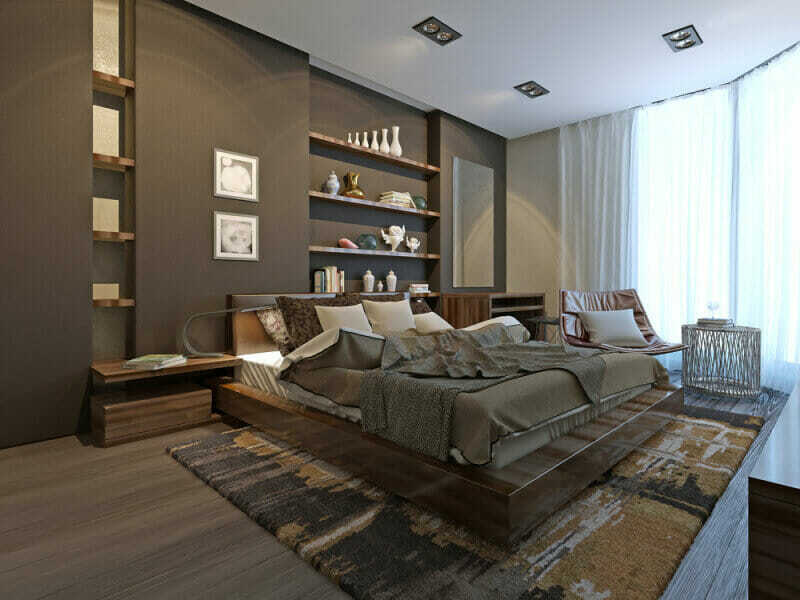 The dark wood, bed frame anchors the space and creates a regal feel to the space. 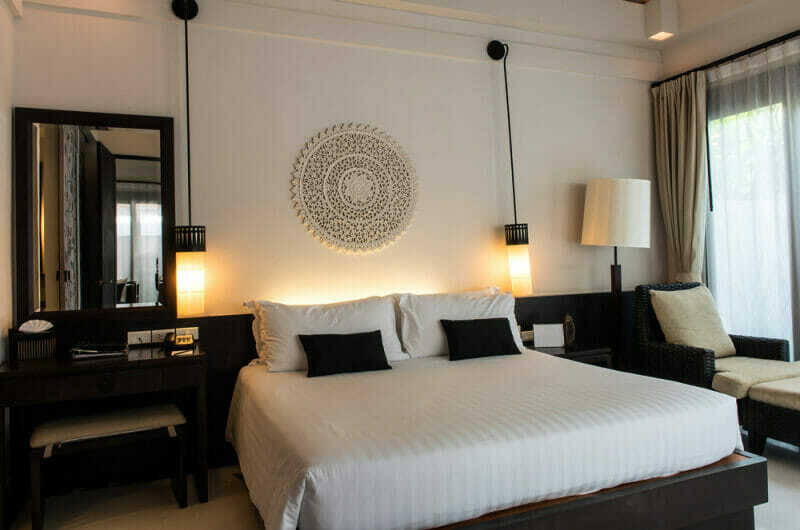 The black and white bedding in this space pairs beautifully with the crisp, white paneling behind the bed.